Enjoy delicious iced tea in the comfort of your own home with the Mr. Coffee Tea Cafe Iced Tea Maker. This appliance brews gourmet iced tea quickly and efficiently with one simple touch so that there is a minimal wait before enjoying your favorite beverage. Using this black iced tea maker is as simple as adding water to the reservoir, adding loose tea leaves or tea bags to the brew basket, adding ice to the pitcher and pressing the brew button. This device makes up to 2.5 quarts of iced tea, and you can also regulate the strength of the tea. Easy to keep clean, the glass pitcher, brew basket and permanent filter can be washed in the dishwasher to make for quick and convenient maintenance. This Mr. Coffee Tea Cafe Iced Tea Maker also features an auto shut-off function, and it comes complete with 20 refreshing iced tea recipes. It is a wonderful way for you to kick back and relax by yourself, entertain guests at a party or barbeque or to serve drinks for your loved ones. Mr. Coffee Tea Cafe Iced Tea Maker, Black:Brews tea bags or tea leavesAdjustable brew strength2.5 qt capacity2.5 qt dishwasher-safe glass pitcherDishwasher-safe brew basketDishwasher-safe permanent filterAutomatic shut-off20 recipes included1-year warrantyDimensions: 11.4"L x 10.5"W x 14.8"HModel# BVMC-TM33Mr. Coffee iced tea maker features easy and efficient one-touch operation Enjoy delicious iced tea in the comfort of your own home with the Mr. Coffee Tea Cafe Iced Tea Maker. This appliance brews gourmet iced tea quickly and efficiently with one simple touch so that there is a minimal wait before enjoying your favorite beverage. 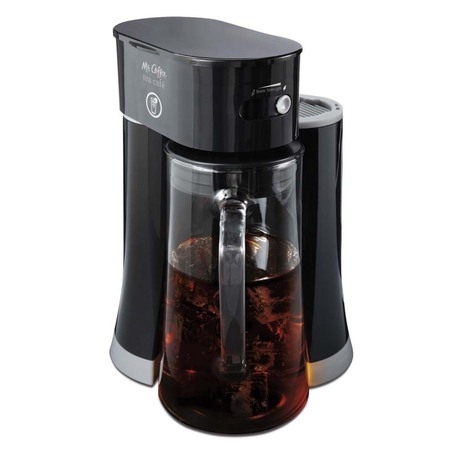 Using this black iced tea maker is as simple as adding water to the reservoir, adding loose tea leaves or tea bags to the brew basket, adding ice to the pitcher and pressing the brew button. This device makes up to 2.5 quarts of iced tea, and you can also regulate the strength of the tea. Easy to keep clean, the glass pitcher, brew basket and permanent filter can be washed in the dishwasher to make for quick and convenient maintenance. This Mr. Coffee Tea Cafe Iced Tea Maker also features an auto shut-off function, and it comes complete with 20 refreshing iced tea recipes. It is a wonderful way for you to kick back and relax by yourself, entertain guests at a party or barbeque or to serve drinks for your loved ones. I LOVE my new Mr. Coffee Iced Tea Maker! I wish I would have bought one/gotten with the times sooner. This one is black & glass-which makes it Classy as opposed to the old white bulky plastic one my parents have. And I love that it's black because all my other kitchen appliances are black and silver. This tea maker has a wonderful Recipe Guide for making special teas, adult cocktails & even a delicious smoothie-which we love. Now after reading some of yalls customer reviews I'd like to address a few things… first please read the whole manual! If you read the manual it clearly tells you “Rotate the shower head position so that it is over the brew basket. Close the top lid and have the unit positioned as (FIGURE 2)” if you do so it will not leak or make a mess! As an added precaution I move my top part to the normal position to look like what is on the front cover of the user manual, then slide my pitcher in that way so I know it's pushed in all the way & will not leak, then I swing the top part out before I brew. Also after my tea maker is done brewing I let it sit one minute so the access liquid can drip in the tea pitcher before I remove it. I read some reviews and a few of you think ice somewhat waters it down or else you don't like using so much ice… well you do NOT have to use ice and if you read the manual it even tells you that. Instead of using ice just fill Cold water to the water line-it's that easy. I do it all the time and no the pitcher will not break without ice. Only rough or clumsy handling will break the pitcher. Oh and I hand wash mine and do not put mine in the dishwasher. As far as stirring goes I use a Universal Flexible Heat Resistant Silicone Spoon or else a soft flimsy Plastic icing spatula and stir trying as much as possible to not bang the sides of the pitcher. Oh and if I am making something with frozen concentrated juice and it needs to be stirred more vigorously I transfer it to a plastic pitcher first. …To be honest I do not use ice when brewing tea unless I have guests who would like a cold glass of tea right away or else I'm following a recipe from the recipe guide. When you do use ice be sure to gently place the ice cubes in the pitcher by hand because I read from someone else's review that they poured bulky ice cubes in from a bag and it cracked the pitcher, so again please carefully place the ice cubes in by hand. *And last but defiantly not least… even though this tea maker wants you to use a bunch of smaller individual tea bags you can use one Family Size tea bag per pitcher but be sure to have it set on Full brew strength; Immediately after its done brewing I stir in a ½ cup of sugar (and yes it fully dissolves) & enjoy. :) Just a note: do not be afraid to experiment tea bag wise people. Also the more tea bags you add the stronger your tea will be. A delicious mint tea I make: 1 family size Luzianne tea bag, 1 small individual Celestial Seasonings Sleepytime tea bag, 3 small individual Celestial Seasonings Peppermint tea bags, (optional: under tea bags place a fresh mint sprig), set about ½ cm from full brew strength, I use water to the water line instead of ice, stir in a ½ cup of sugar right after its done brewing and then let it chill in the fridge before drinking. The photo shows the position to brew tea in and it making a Pineapple Orange Cooler. I LOVE my new Mr. Coffee Iced Tea Maker! I wish I would have bought one/gotten with the times sooner. This one is black & glass-which makes it Classy as opposed to the old white bulky plastic one my parents have. And I love that it's black because all my other kitchen appliances are black and silver. This tea maker has a wonderful Recipe Guide for making special teas, adult cocktails & even a delicious smoothie-which we love. Now after reading some of yalls customer reviews I'd like to address a few things… first please read the whole manual! If you read the manual it clearly tells you “Rotate the shower head position so that it is over the brew basket. Close the top lid and have the unit positioned as (FIGURE 2)” if you do so it will not leak or make a mess! As an added precaution I move my top part to the normal position to look like what is on the front cover of the user manual, then slide my pitcher in that way so I know it's pushed in all the way & will not leak, then I swing the top part out before I brew. Also after my tea maker is done brewing I let it sit one minute so the access liquid can drip in the tea pitcher before I remove it. Also you do NOT have to use ice and if you read the manual it even tells you that. Instead of using ice just fill Cold water to the water line-it's that easy. I do it all the time and no the pitcher will not break without ice. Only rough or clumsy handling will break the pitcher. Oh and I hand wash mine and do not put mine in the dishwasher. As far as stirring goes I use a Universal Flexible Heat Resistant Silicone Spoon or else a soft flimsy Plastic icing spatula and stir trying as much as possible to not bang the sides of the pitcher. Oh and if I am making something with frozen concentrated juice and it needs to be stirred more vigorously I transfer it to a plastic pitcher first. …To be honest I do not use ice when brewing tea unless I have guests who would like a cold glass of tea right away or else I'm following a recipe from the recipe guide. When you do use ice be sure to gently place the ice cubes in the pitcher by hand because I read from someone else's review that they poured bulky ice cubes in from a bag and it cracked the pitcher, so again please carefully place the ice cubes in by hand. *And last but defiantly not least… even though this tea maker wants you to use a bunch of smaller individual tea bags you can use one Family Size tea bag per pitcher but be sure to have it set on Full brew strength; after its done brewing I stir in a ½ cup of sugar & enjoy. :) Just a note: do not be afraid to experiment tea bag wise people. A delicious mint tea I make: 1 family size Luzianne tea bag, 2 small individual Celestial Seasonings Peppermint tea bags, 2 small individual Celestial Seasonings Sleepytime tea bags, (optional: under tea bags place a fresh mint sprig), set on almost full brew strength, I use water to the water line instead of ice, stir in a ½ cup of sugar after its done brewing and then let it chill in the fridge before drinking. The first photo shows the position to brew tea in and the items I use to stir with. The second just shows it making a Pineapple Orange Cooler. I bought this for my mother for Christmas and she loved it! She was skeptical at first because she had something similar years ago that was disappointing, but this really delivered. The glass picture was a welcomed feature and even thought it was 0.5qts smaller, the simplicity in making tea made up for that. Only con though is that the lid does not fit very securely. When you pour a pitcher, the lid tends to fall out and is only useful when brewing. five stars for this tea maker! This is the second one I have bought. The first one still works but I broke the carafe to it after 5 years. Yes I see a lot of reviews stating the carafe is too thin but to tell you the truth, if you watch what you do with it the carafe can last for a long time. Mine was 5 years old and it fell from the counter to the sink. The tea maker gets a 5 star from me. I have had no problems with the new one or the latter one. I love the tea flavor from the brew. You can make a slow brew or fast brew depending on how strong you like your tea. I do suggest that you transfer the tea to another pitcher to put in fridge. This may be were a lot of people complain of the carafe breaking. What a great upgrade to my favorite small appliance! It has a cool new sleek look and a new way to pour in the water. I love the new look - and the black works so much better in my kitchen than the bright colors they've been selling for the past many years. I debated for months whether to buy this, based on mixed reviews regarding the quality of the carafe (easily broken/cracked), the unit leaking, etc. I've had it over a month now and have made a pitcher of iced tea about every 5 days. I love it! It's so much better than the plastic model. I can get the pitcher itself cleaner (no staining) and it's not as fragile as others have made it seem. It's so easy to make the tea - don't have to use a paper filter - and I like that you can adjust the strength. I'm only using 6 tea bags now, where with the plastic model I was using twice that! The size of the pitcher fits better in my fridge, too. Overall, VERY happy that I took the gamble and tried this! FOLLOW the directions and you will be fine. You just have to experiment with the settings and the tea that you use to get tea that suits you. Like most people I have an ice maker in my refrigerator and make sure to fill the pitcher with ice. That give you automatic dilution, cool tea, and keeps your ice maker always full of fresh ice. Be careful as the glass pitches is fragile. After brewing, I transfer the tea to a more robust pitcher for table use. I used my last Mr. Coffee ice makers until they died. This one is my favorite with the glass pitcher. I can put it on my table and its not all coffee stained as my old plastic pitchers were. People talk about glass pitchers breaking, so I ordered a couple extra pitchers. However, I let the tea brew into a plastic beer pitcher and then transfer it into the glass pitcher. My husband says not necessary as long as you don't put ice cubes in the glass pitcher and let hot tea drip into it. The change in temperatures is what could possibly lead to pitcher breaking. 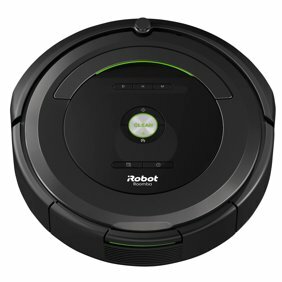 The sleek black unit looks good on my kitchen counter also. We drink a lot of tea. I love the convenience of the Mr Coffee Ice Tea Maker. I don't always use the glass tea pitcher that it came with. I use the plastic pitcher that I serve my tea in and it works just as well. Just make sure the pitcher is under the spout where the tea comes out. Comes out great everytime.